less actionable. When Amazing-Man came out, four months after Wonder Man (and the first superhero to debut in his own title), DC had to endure him because there was no legal way to shut him down. 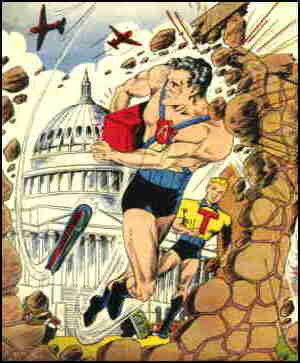 Amazing-Man had no wimpy alter ego like Clark Kent (or Wonder Man's Fred Carson). He wasn't in love with someone who had eyes only for his costumed self, like Lois Lane (or Wonder Man's Brenda Hastings). And while it took Superman years to develop a relationship with his arch-enemy, Luthor, Amazing-Man had a fully developed arch-enemy right from the start — one who was inextricably tied in with his own origin, thereby making the fact that he (like Wonder Man) came from a lamasery rather than another planet an integral part of his adventuring life and not just a little incident that didn't warrant mentioning in the average story. Amazing-Man ("civilian" name, John Aman) came from Tibet, cared for by monks after his parents died. He grew up steeped in their lore, and when he came of age, was chosen by their Council of Seven to receive the exclusive benefit of their highest training and most valued secrets. This created resentment on the part of another disciple, whose name was never given, but who became known as The Great Question (no relation). When John reached the age of 25, he was sent to battle evil in the outside world. The Great Question followed, and attempted to thwart him at every turn. In addition to great strength and control over his body, plus certain mental powers up to and including a low level of telepathy, Amazing-Man also, through western science, acquired the power to disappear in a cloud of green vapor. Thereafter he was sometimes called The Green Mist. The hero was created by Bill Everett, who achieved greater fame the following year, as the creator of The Sub-Mariner. He first appeared in Amazing-Man Comics #5 (the first four issues had been titled Motion Picture Funnies Weekly), published by Centaur Publications (The Clock, Speed Centaur) and dated September, 1939. Others introduced in that issue include Cat Man (no relation), by Tarpé Mills (Miss Fury); The Iron Skull, by Carl Burgos (The Human Torch); and others with equivalent name recognition. Amazing-Man continued for a couple of years, during the height of the superhero craze. In #21 he acquired a sidekick, Tommy the Amazing-Boy — an early entry in a long line of sidekicks who show their commitment to the idea of secret identities by using their own first names as superhero monickers (cf. The Black Terror and Tim, or Captain Flash and Ricky). Tommy was the kid brother of Amazing-Man's girlfriend, reporter Zona Handerson. But Tommy didn't last long, because Amazing-Man Comics was nearing the end of its run — and so was Centaur Comics, which is why there was nobody to bring him back after his title ended with its 26th issue (January, 1942). Decades later, Amazing-Man's origin story was appropriated, line for line, by cartoonist Pete Morisi, as that of his Charlton Comics character, Thunderbolt..
And decades after that, writer Roy Thomas (The Invaders) introduced a black superhero into his All-Star Squadron, which was set in the 1940s, and had to create a new one because there weren't any actually on the scene back then. He called the new character Amazing-Man, complete with hyphen, and used "Will Everett" for a secret identity, an obvious reference to the original Amazing-Man's creator. This new Amazing-Man later appeared in the Young All-Stars series, also set in the '40s. His grandson, who also calls himself Amazing-Man, has turned up a few times in the modern-day superhero milieu. In 1992, Malibu Comics, in an attempt to make its own superhero universe, did up a bunch of new versions of old Centaur characters (such as The Arrow, Mighty Man, Air Man and of course Amazing-Man), and slapped them into a new group called The Protectors. The whole lot of them ran fewer issues than Amazing-Man alone had in the '40s. The real Amazing-Man hasn't been heard from in over 60 years.